Years ago, I read that bees need to drink water so I put a dish out on the retaining wall in front of my perennial border. It’s nothing special, just a plastic saucer, the kind that goes under a flower pot. I put several rocks in it to give it weight and to give the bees a place to land and sip the water without falling in. It worked. The bees come and so do wasps and butterflies. Also, birds of varying sizes and species. The chipmunks and the squirrels take long drinks from the saucer. Wild turkeys dip their heads, drink, lift their heads and look around. Repeat. Robins take splashy baths. The bunnies (we have a lot of bunnies this year) probably also take drinks but I haven’t caught one yet. Ditto with a coyote. 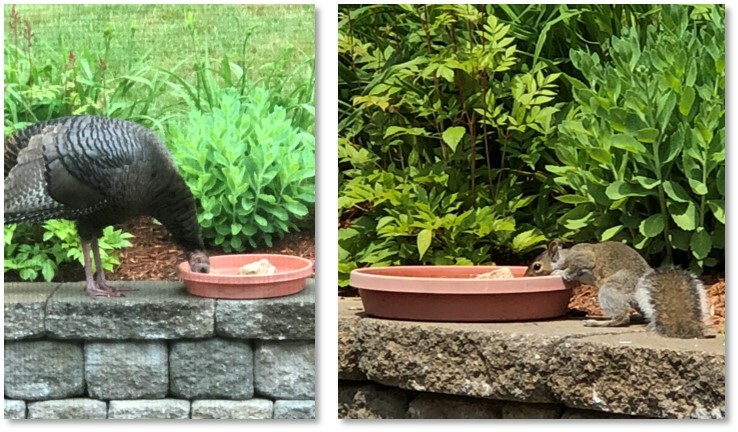 I enjoy watching the various critters stop by and I know the saucer is empty when a squirrel dips his head, then looks up in consternation as if asking for a refill. Periodically I dump what’s left in the saucer and refill it to prevent mosquitoes from hatching in stagnant water. With all the traffic, it rarely lasts long enough to get stagnant, though. 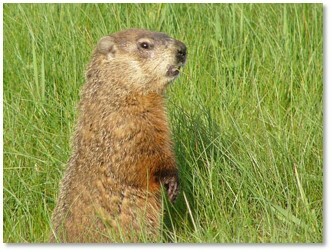 The one animal that I did not want to attract but that has taken up residence nearby, is a woodchuck. The woodchuck (Marmota mormax) belongs to the marmot family and is sometimes called a groundhog. As in Punxsutawney Phil on Groundhog Day. Mostly unassuming creatures, they mumble about on the grass in early morning and late afternoon and spend long hours sunbathing in between. What’s not to like? One entire flat of marigolds planted in front of my tomatoes and eaten down to the ground. A pot pansies flattened on one side with all the flowers snipped neatly off. Same with three of the six impatiens plants in the front border. One flat of double petunias minus the lovely purple flowers. I looked out the window and thought, what happened to the petunias? Dunh, dunh, duh! One coreopsis eaten to a few thin stems. It explained why that patch of the garden looked unusually bare. One hosta chomped down to just a few leaves. Over and over again. One large, and recently purchased, ladybells bushy with leave, full of buds and ready to bloom. I put it on the retaining wall. 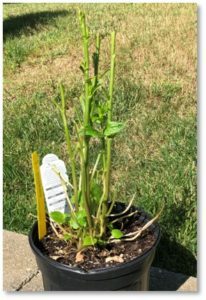 When I came out to plant it the next day—bare stalks! And that’s just in my yard. Other neighbors have seen the woodchuck sunning himself—sometimes on the front walk, as if he owns the place. I enjoy getting along with the neighboring wildlife but enough is enough. I don’t purchase expensive annuals and perennials, then get down on my knees to plant them, so a rodent of unusual size can have them for dinner. What to do? I went to the garden center and bought a large bottle of rodent repellent made largely of ground-up hot peppers. I sprayed this diligently on nearly everything he likes to eat. This must be a Texas woodchuck, though, because he really loves his hot sauce. It had no repellent impact at all. Time for the heavy artillery. Were I a stand-alone homeowner, I would have to purchase a Havahart trap, find his den, set up the trap and follow the seven steps to catch him. Then check it until I nabbed the critter, and relocate the woodchuck to a patch of woods far away. I own a condo, though, so I just sent an email to the management company. They will do all the trapping and relocating for me. When he’s gone, I can plant the ladybells that are currently recuperating on the deck table without fearing that Marmota mormax will chow down on them for breakfast. Then I’ll put in more marigolds around the tomatoes and peppers. This entry was posted in Animals and tagged groundhog. perennials., Havahart trap, marmota mormax, rodent repellent, woodchuck by Aline Kaplan. Bookmark the permalink.